You can get started by trying a week of coaching at a discounted rate. More about fees and coaching programs below. A coaching session with Milli. 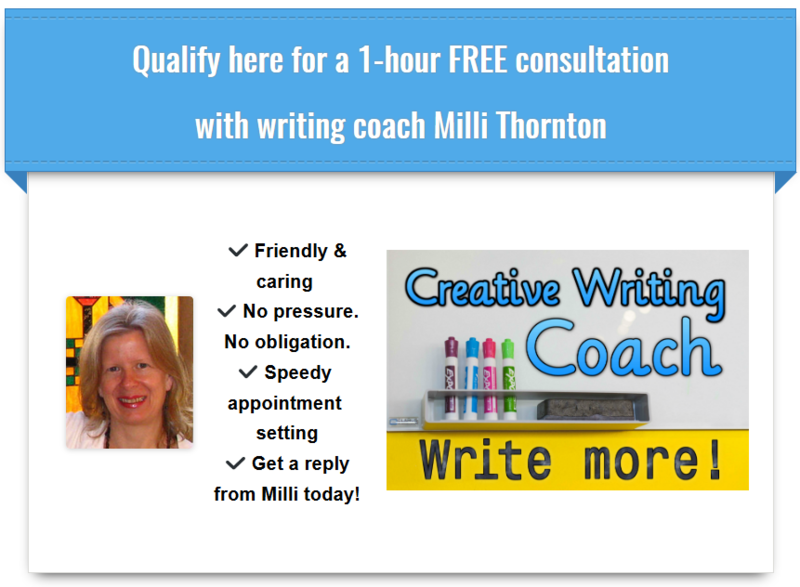 Milli will use questions and insights to draw out your deepest writing issues. She listens for the clues that will guide her to help you. Increased productivity. Write heaps more! If you’re currently feeling very unproductive (maybe not writing anything at all) we will quickly change that dynamic. If you commit to Milli’s program, she can help you write thousands of words for your book or other writing project. Assignments designed for your needs. Whether you’re trying to write a novel or recapture your passion for writing, Milli will cater especially to your situation. Each assignment will either zero in on where you’re trying to go with an existing piece of writing, or focus on a way to revive the fun. Encouraging feedback for your completed assignments. The goal at Writer’s Muse is for you to enjoy your creativity. Being affirmed in this way will help you be productive. Gentle and constructive critique if you need it. Critiques are a dime a dozen and everyone wants to tell you how you should have written your story. What you’ll get instead will be constructive guidance on how to allow your own imagination and writing skills to improve any areas that need improving. Milli also uses her intuition to put herself in the shoes of the reader and give you feedback based on what your readers will notice and experience. Email & text message support. If you need help getting started with your assignment, or if you get stuck part-way through, you can email Milli for help. In fact, you’re expected to get help if you get stuck. You’ll also get regular text message follow-ups to help you finish your assignments (accountability!) and these will be tailored to your needs and preferences. Creative help and emotional support whenever you need it. The clients who do the best here are not shy about reaching out to Milli in between coaching sessions. Milli will reply to your texts or emails promptly and offer you the right help. If warranted, this would include a same-day phone call to untangle your issues and get you back on track.